Hi everyone. Do you know the meaning of this SMS? If yes, then perfect! If no, don’t worry, it’s ok. At any rate, we’re going to have a look now at something different which you perhaps do not know about… the world of the language of text messages. Salut tout le monde. Sais-tu c’est quoi le sens de ce texto? Si oui, parfait! Si non, ne t’inquiètes pas, c’est pas grave. De toute façon, nous allons maintenant regarder quelque chose de différent que peut-être tu ne savais pas… le monde de la langue des textos. Just like in English, French also has many commonly used SMS acronyms. An SMS is a “texto“ in French. 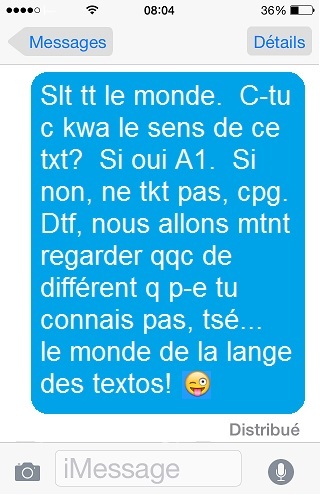 If you have ever exchanged a number of SMS in French, I’m sure you have ran into them: “mdr” instead of “lol”, “qqn” instead of “quelqu’un”, etc. French SMS acronyms are sometimes different in France/Europe than here in Canada, owing to a difference in colloquial expressions. Example from France (which we don’t say/use): “gp“ (gros pigeon) = means a “looser” in English (we’d generally say “cave” in Québec / Canadian French). Example from Canada / Québec (which is not said/used in France): “cbr“ (crampé ben raide) = means “keeling over with laughter” in English. In Europe, people may say “dcdr” (“décédé de rire” = “dead from laughter”). The following are the most common text acronyms people use on this side of the Atlantic. wtf = wtf (ouate de phoque)… smart, eh? By Quebec Culture Blog 101 in Language and Language related on May 22, 2015 .